At last I am offering my fleece socks on-line. They have been my best sellers at craft shows for years and they are priced to warm your heart as well. The children's socks are $4 a pair, $6 a pair for youth sizes and adult sized socks run $8 a pair, Shipping charges are NOT included in these prices and will be $2.00 per pair. My socks feature an elastic free cuff, wash well, return to their original shape and are soft and warm for winter. Many use them as bed socks, but others, including myself use them in or out of shoes. My daughter works outdoors all winter and swears by them. They make great ski socks! I have named them Great Feet for Great Feats and have testimonials that when worn, not only are your feet warm, but they can perform miraculous feats. When I was a child, it was tradition that the Easter Bunny brought us Keds--remember those? In new Keds I could run faster and jump higher! Mine were usually red, which I think added to their power. And so I have made my fleece socks in all colors and patterns, so you can pick whichever you feel will give you the greatest lift. Believe in them and they will do just that!! One of my most special birthday presents was a big box of "toe socks" in all colors and patterns! It was the cheeriest gift ever, and so are my fleece socks. 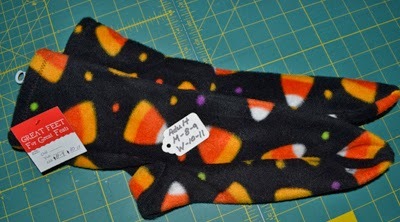 I first made fleece socks for my young adult daughters for Christmas a few years ago, and before trying them out, they simply pushed them aside, believing them to be one my my weird home-made-"special" gifts that round out their Christmas every year. They then asked if I would be offended if they "re-gifted" them. Their friends liked the socks so well, that they came back and requested more. My girls soon tried them out themselves and now place their order every Christmas for themselves and their friends!